Indian IT major Infosys should be avoided at current levels. Investors should be willing to purchase the stock at lower levels in the face of slowing growth. The stock trades closer to dot-com highs. Wait for a 20 percent price correction or a significant time correction. 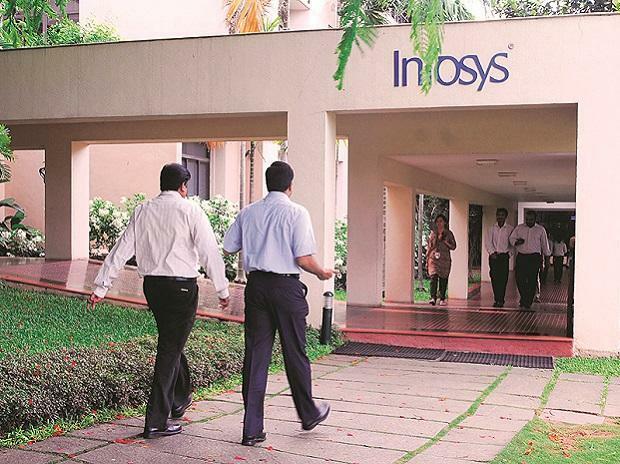 Infosys (INFY) released Q4 2019 numbers on Friday and ended the day almost 4 percent lower as the company cut the constant currency revenue guidance to 7.5-9.5 percent for FY20 compared with the 8.5-9 percent growth it had expected for the previous fiscal. Looking at the fundamental and the technical picture, I believe it is better to wait for undemanding entry points in this stock. The company is attempting to stage a turnaround by investing in digital services and is making efforts to arrest the high attrition rate of 20.4 percent (annualized consolidated) by increasing salaries to retain talent and do more local hiring in its biggest market, the U.S. I believe that after the latest earnings, some price target cuts will be announced by analysts and moderate the valuations which currently seem high to me. At a PE (TTM) of 21.10, the stock is overpriced and does not offer the margin of safety which an investor should seek in a long-term story. Some of the fundamental charts, available here on SA, indicate that the company's business metrics have been on a downhill for the last five years. The gross margin, EBIT margin and Net Income margin have been on decline since 2015. Any intelligent investor would want to wait for these core numbers to start stabilizing before he puts his money to work, even if it means waiting for a couple of quarters or more. That the company is facing growth challenges can be gauged from the fact that it cut FY19 EBIT margin guidance a year ago and slashed FY18 revenue growth guidance in October 2017. They are highly uninspiring events. 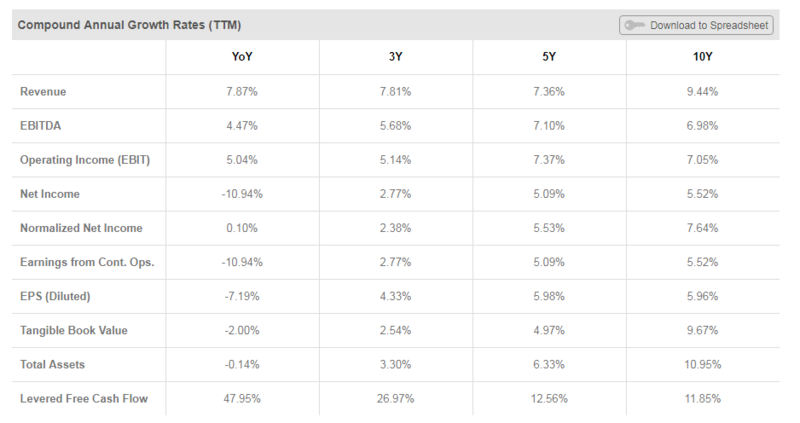 The spreadsheet below clearly illustrates that the last 3-5 years have been slow growth years with an EPS CAGR of 4.33% over 3 years and 5.98% over 5 years. Net income over the last 3 years has grown at a compounded rate of just 2.77 percent annually. The revenue growth rate has remained in single digits and is always susceptible to cuts. For a company that has been struggling to expand its margins while its closest competitor Tata Consultancy Services (OTCPK:TTNQY) continues to outperform Street expectations, the PE ratio of 21 seems lofty. 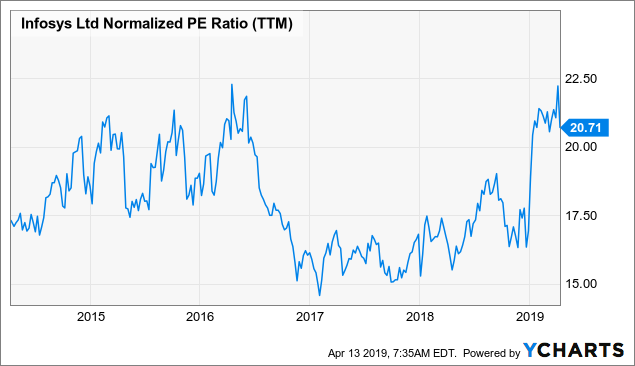 The current PE is closer to the 5-year highs and the normalized PE ratio (TTM) chart below indicates that it has never been a good buy zone. The multi-year Infosys monthly price chart below indicates that we are trading close to the dot-com highs. In the face of weaker growth in FY20, I would not recommend buying Infy at these levels. The run-up in Infy in the last year or so occurred partly due to the Indian Rupee depreciating against the U.S. dollar which led market participants to believe that the company would post better numbers with the currency tailwind. The company's performance has been muted thus far. 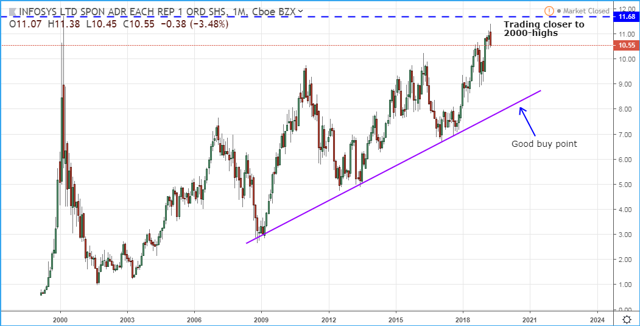 However, the upward trendline connecting the panic bottom of 2009 with the subsequent panic bottoms reveals that the region of $8.00-$8.50 would be a good starting point. I missed out on the last panic bottom which occurred because of the tussle between the then CEO Vishal Sikka and the founding father N.R. Narayana Murthy over corporate governance issues. At that time, the stock traded at just $7 and ran up almost 60 percent since then. I was waiting for more clarity and missed the bus. I won't miss if it comes to my buy zone this time. After a 20 percent drop, I believe most of the negatives will be priced into the stock and valuations will have sobered enough for me to hold on for the long term.